In China, authorities see #MeToo as a political threat. 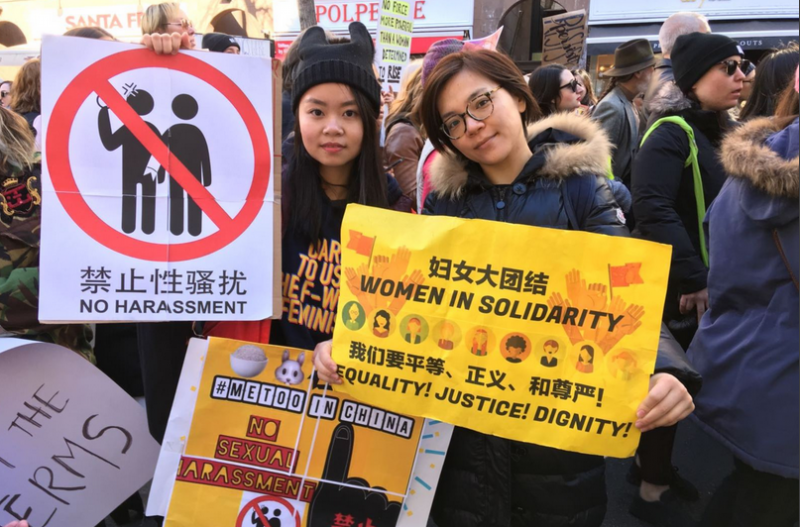 Chinese students displayed anti-sexual harassment banners at the January 20 Women's March in Washington, DC. Image via Voice of America, licensed for reuse. 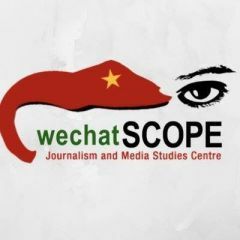 In 2017, our team at the University of Hong Kong built a technical web “scraping” system for studying censorship on WeChat's publicly accessible pages. Throughout 2018, we tracked more than 4,000 public accounts covering daily news and preserved censored posts in a publicly accessible database, WeChatscope. This article is the sixth in a partnership series with Global Voices. Around the world, #MeToo was one of the most popular hashtags on Twitter in 2018. The global campaign took on different dimensions in dozens of countries, including China. Our data set indicates that online allegations of sexual misconduct were one of most heavily censored topics on WeChat in 2018. The campaign first emerged on social media in China in October 2017, mostly in the form of reports about revelations among actors and film producers in Hollywood. But similar to what happened in other countries, after these stories made the rounds online for a few weeks, local people began to speak up about their own experiences. In November 2017, female reporter Sophia Huang began investigating allegations of sexual harassment that appeared in the media. She used the hashtag #MeToo and launched an anti-sexual harassment platform on WeChat to conduct a survey and compile sexual harassment cases. The first high-profile #MeToo exposé in China to make international news was reported on Weibo on New Year's day of 2018 by Luo Xixi, a former student at the Beijing University of Aeronautics and Astronautics. Luo, who had moved to the United States, revealed how she had been sexually harassed by University professor Chen Xiaowu 12 years prior. Her story, which included the hashtag ‘#Wo Ye Shi’ (#我也是, “#MeToo”), went viral within two days. After almost two weeks of investigation, Chen was sacked by the school. The Ministry of Education also stripped Chen of his academic title as Yangtze River Scholar. The incident triggered a series of campaigns and petitions in several universities calling for school administrators to establish official policies against sexual misconduct. Feminist activists also started using #MeToo and #Wo Ye Shi as campaign hashtags on social media. Within two weeks, these tags became popular topics on Weibo but were disabled from automatically generating a topic page in February. A new term, “rice bunny”, which sounds similar to “me too” when spoken in Chinese, was used as a replacement hashtag to get around the censors. When Chinese feminists attempted to take the campaign forward for International Women’s Day on March 8, 2018, they were blocked by Chinese censors. The feminist campaign hashtag “#38antiharassment” was blocked. The hashtag #Metoo or #Wo Ye Shi was allowed to be used but only to discuss sexual harassment campaigns in other countries like South Korea. One month later, in early April, the Chinese #MeToo campaign resurfaced when Li Youyou, an alumna of Peking University, published a post accusing Nanjing University literature professor Shen Yang of sexual misconduct against Gao Yan, a fellow classmate of Li's who died by suicide in 1998. Shen Yang denied the accusation but the school decided to terminate the 60-year-old professor's contract for “violating teaching ethics”. Coincidentally, Shen is also a Yangtze River Scholar. Shortly thereafter, eight university students from Peking University wrote an open letter to school authorities, asking them to release information about their investigation into Gao Yan’s death. This relatively small collective action elicited a strong response from university authorities who attempted to threaten the students with further action. But this backfired when one of the students, Yue Xin, wrote another open letter, exposing how the school had harassed and intimidated the students. Although Yue’s letter was quickly censored, fellow students took screenshots of her letter and circulated them online. Soon, posters appeared on campus expressing support for the #MeToo student activists. According to China Digital Times, a message circulated in various WeChat groups at Peking University alleging that the school’s Communist Party committee was concerned about the incident. The committee apparently saw the students’ response as a form of activism, or as a political movement in collusion with external forces, and thus presenting a threat to the broader political establishment. During this time, a search of Yue Xin on WeChatscope's database generated zero results. This may have been a sampling error, but more likely it indicates that the term “Yue Xin” was marked as a politically sensitive term and had been completely censored on WeChat's public domain. Even though the death of Gao Yan had taken place 20 years ago, posts mentioning the incident were more frequently removed on WeChat than other individual cases because the keywords related to it were flagged for being part of a “political movement”. A few examples of posts censored on WeChat that were linked to the Gao Yan incident at the Peking University. The first post, “Peking University students Xu Fan and Wang Ao back from 1995 urge Yangtze River scholar Shen Yang not to lie anymore” (北京大学95级徐芃、王敖请长江学者沈阳不要再说谎了) was a public appeal made by two university alumni and published on April 5, 2018. WeChat took the post down on the same day. The second post, “The resistance and redemption of Gao Yan incident” (高岩事件中的反抗与救赎) is an investigative piece interviewing Gao Yan's parents and Li Youyou. The report probed into the power relations between teachers and students in a university institution. It was published and also removed on April 8. The third piece is “Please pay attention to the suicide of Gao Yan 20 years ago and the campus sexual harassment policy” (关注 | 20年前的高岩自杀事件 迟到的校园反性骚扰制度). The commentary, published and removed on April 9 also challenged the absence of policy in dealing with campus sexual harassment cases. Despite the clampdown, individual stories about sexual harassment still continue to circulate on social media. According to BBC's estimation, between June to August 2018, around 30 public figures from education, media and NGO sectors have been accused of sexual violence in China. The most explosive story was told by 25-year-old Zhou Xiaoxuan about how she was sexually harassed by Zhu Jun, a prominent TV host back in 2014. Her 3000-word story was first shared among friends in a chatroom. One of her friends, an environmental activist named Xu Chao, had her permission to share the story on Weibo and in two hours it went viral. In the next few days, the term “Zhu Jun” appeared on Weibo’s hot search list. Though Zhu is closely associated with the China Central Television, public discussion of the case was subjected to less censorship than the Peking University incident. In WeChatscope's database, we retrieved one censored post, “New development regarding Zhu Jun's incident. Will people still believe teacher Zhu Jun is innocent?” (朱军事件有了新情况，有多少人还相信朱军老师是清白的？), with a rhetorical question in the headline which may have led readers to believe that Zhu is guilty without any double, and was published and deleted on November 12. Zhu has denied the accusations and threatened to sue Zhou for defamation, in an ongoing legal dispute that continues to attract public attention. Zhou is now attempting to bring the country’s first-ever civil sexual harassment lawsuit against Zhu. Our data supports the argument that Chinese censors are blocking content that challenges authorities and advocates for change, even when it does not explicitly touch upon political issues. But it also shows that the #MeToo campaign in China, and other content with similar messages, have managed to find space on Chinese social media. Every now and then, new cases flash on the internet and some attract widespread public attention. When a person shares their story and it strikes a chord with others, it can be shared by tens of thousands of individual users in a matter of hours. Despite efforts to censor these kinds of messages, these outbursts of sharing have had a significant impact on Chinese university campuses.